BALDERDASH I SAY UTTER BALDERDASH! Mr Roy do u know dat the dead bodies were being carted to the secretariat which ia a short walk away from the blast site in order to work as canon fodder against the government in order to incite the people to the extent of rioting and a curfew to follow.I was there when the blast at Ganeshguri took place.It was my first xperience of a nearby bomb blast. Believe me I was at the Guwahati Tea Auction centre when the blast took place.The doors of the auction hall vibrated and the ground shook.The auction hall is like about 700-800 meteres away.I was quite lucky as I had just dropped into the auction to take the brokers pages for my office and was delayed as the regular guy had already taken the fresh sale pages.So I decided to wait for a while, which was a very fortunate decision because if I had carried on after getting the sale pages, then I would have ended at the same spot where the blast took place at that unfortunate hour. I thank my god and the blessings of my sis on this day that saved me from certain injury or death.I came out and saw thick smoke coming out from under the flyover in ganeshguri.It was a really horrific sight and what followed was even worse. I told my driver to get in and drive back to office.There was no way we could turn back from tha area so I made him drive on the wrong side of the road where theres an island to crossover into the other lane.As i made my way back to office, i saw one or two ambulances go by carrying the innocent victims.Then came a gypsy packed with 4-5 dead bodies and blood dripping down its rear end.That really shook me up and left me wondering what the world is coming to? We grow up in our own blissful lives when it takes a day like this to shake you up and make you realise that ure living with terror.Godamn those terrorists and godammn our government.Infact goddamn the ugly underbelly of our existence that harvests innocent lives for some hardliners fancy.I hope that none on this blog or anywhere in the world may haveto go through such a day……………God bless u all! Reading this narration I got a chilled spine. It is horrific. How could human beaing do this? No moral no conscience no love for humanity? 30 OCTOBER 4:25 PM, GUWAHATI: In between 11.30 to 12 noon powerful than Diwali crakers sound were heard in series that too with lots of smoke and outcry of the masses. It was evident that bomb had blast. Assam was rocked by a series of 13 powerful bomb blasts on Thursday morning, six in Guwahati city, two each in Bongaigain, Barpeta Road and Kokrajhar and one in Barpeta leaving at least 47 people dead and 282 injured at the time of filing this report. Injured have been shifted toGuwahati Medical College Hospital (GMCH) and Mahendra Mohan Choudhury Hospital (MMCH). Wel placed sources informed this correspondent that the four blasts in Guwahati city occurred simultaneously at Ganeshguri, Kachari DC Court , market hub Fancy Bazaar and educational institution hub Paan Bazaar between 11.30-11.35 am. Of the four bombs, one at the Ganeshguri was planted in a car.Reliable police officials did not rule out the involvement of Bangladesh-based terrorist group Harkat-ul-Jihad-al-Islami (HuJI) in the blasts. Curfew has been imposed in all the major road of the city. City traffic has sealed all the movements of vehicles other than press persons. Red alert has been declared across the state while the Kamrup district has been put under Section 144. In Guwahati, angry mob set a police van and a fire tender on fire. Mobs has vandalized every thing around them. They were seen attacking press persons as well. Police personnels were forced to open fire to disperse the crowd and the mob. Panic struck as all phone lines were jammed. The city has a wear and tear look now. Most of the blasts took place in busy marketplaces. Being the festival of Bhai Dooj, the markets were quite crowded which caused more casualties. NEW DELHI, Oct. 30 — Eleven deadly bomb blasts ripped through India’s northeastern state of Assam Thursday, killing about 50 people and leaving more than 300 injured. The serial blasts took place before noon, within a span of 50 minutes. State officials described the explosions as the worst ever in the violent and troubled history of Assam, where separatist insurgency groups have been active since the early 1980s and recent bomb attacks have been blamed on Islamist militants from neighboring Bangladesh. 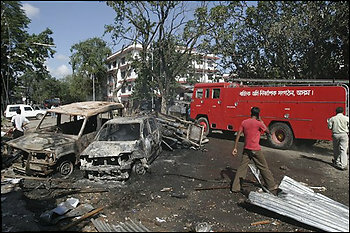 The first of the spate of bombs went off in a crowded vegetable and fruit market called Ganeshguri, in Guwahati. The intensity of the blast was so high that it caused a major fire in the area and gave rise to a thick plume of smoke that engulfed the entire market and places nearby. The second explosion was in the car park of a government office and another at a bazaar near a police station. No group has claimed responsibility for the blasts, but officials indicated that it could be the handiwork of a local militant group called the United Front of Asom (ULFA) that has been fighting against the Indian state for an independent homeland. But officials also said they could not rule out the involvement of other groups. Police officials said that the number of the dead may rise. 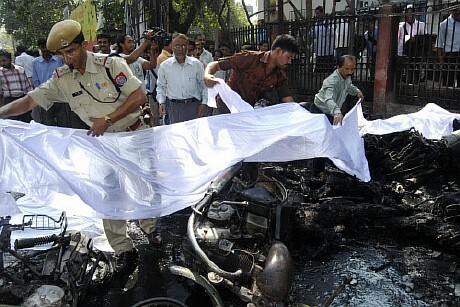 Six of the blasts took place in the state capital, Guwahati. Television images from the market showed mangled heaps of metal and dismembered corpses strewn in the midst of bloodied heaps of potatoes and onions. A perceived delay in the time it took for emergency help to arrive led to public fury and street violence, as angry, slogan-shouting crowds set government vehicles on fire. An injured eyewitness told an English news channel, Times Now, about the scene. Top officials of Assam went into a huddle in Guwahati to deal with the emergency, and a central team from New Delhi left for the state by mid-day to assess the situation and aid in the investigation. Police imposed a curfew after the angry crowds took to the streets. 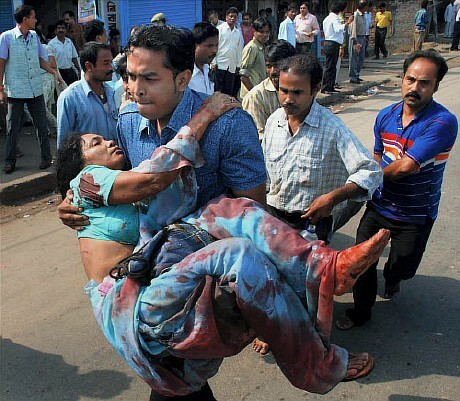 Since May, several Indian cities have been targeted by bombings in public places, killing more than 160 people. 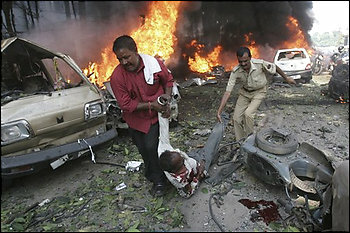 Officials have arrested suspects in some of the blasts from a new group that calls itself the Indian Mujahideen. Last week, some Hindu radicals were also arrested for their alleged involvement in one of the blasts. Several separatists groups are active in Assam and India’s other northeastern Himalayan states, bordering Bangladesh, China, Myanmar and Bhutan. Dozens of these groups, broadly organized along ethnic lines, have been fighting New Delhi and each other for greater control of the region. 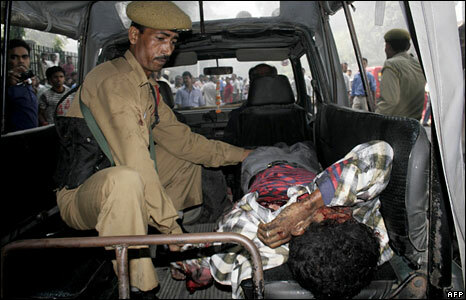 Thursday’s serial bombings were the third bomb blast incident in Assam this year. Powerful explosions in March and June had rocked the state. More than 10,000 people have died in the northeastern region in the past decade.